Who is the world’s biggest employer? The answer might not be what you expect. It’s often said that Indian Railways is the largest employer of people in the world, and if not Indian Railways, then the UK’s National Health Service. Neither employer can take the top spot, however, which in fact goes to the US Department of Defense, which can claim over 3.2 million employees on its roster. Indian Railways in fact lands in the number 8 spot, with a 1.4 million-strong workforce, and the NHS is in position 5 with 1.7 million employees. 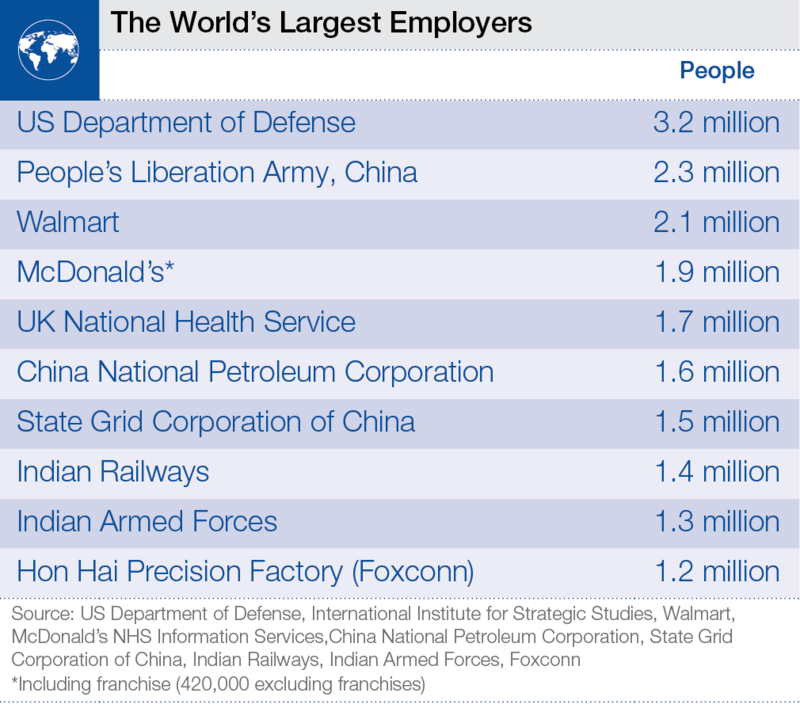 Second is the People’s Liberation Army (the Chinese military) with 2.3 million, and in third is the US supermarket giant Walmart, with 2.1 million workers (although 175,000 of Walmart’s staff work for UK supermarket chain, Asda). McDonald’s lands in 4th place with 1.9 million employees, however, as the majority of its restaurants are franchises, this figure falls to 420,000 when they are excluded. Following the NHS in 5th place is the state-run China National Petroleum Corporation with 1.6 million. Another Chinese company, The State Grid Corporation of China lands in 7th with 1.5 million. Immediately after Indian Railways in 8th (1.4 million) is the Indian Armed Forces, with 1.3 million. Hon Hai Precision Factory (better known as the electronics manufacturer Foxconn) comes in 10th place with 1.2 million. Read more: 5 things you need to know about the future of India’s railways.